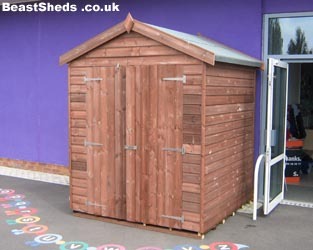 Garden Storage Sheds - Free Fitting and Delivery on all sheds. 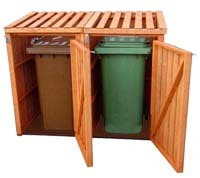 Our Garden storage solutions provide a safe building to keep any sort of goods. As they are not considered permanent structures you don't need planning permission for them*. This makes them ideal for anyone with an area of land (patio, driveway, garden etc) from 4 to 20 square foot or beyond! Our hard wearing sheds for on-site storage. A benefit of using a storage shed is there are no restrictions on what you can put in it! This makes one ideal for restaurants and cafes to put used oil drums and waste etc. Storing stock in it, such as vegetables etc. Petrol stations and garages can store low value goods such as toilet rolls etc. Market stalls keeping goods dry and secure when required. Pet shops can use them for hay or even animal storage. Having storage sheds, right next to one of your buildings' entrances (pictured) is a true asset for your business. You'll have a cheap and easily accessible building that requires no planning permission* for expanding your stock! Any of our general purpose buildings would be suitable for someone who just needs a place to keep their goods and valuables safe and secure. And instead of storing your items in a companies warehouse, you have the convenience of having them on-site. 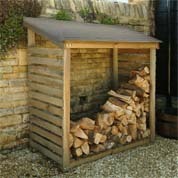 Hazardous products that require to be covered and kept away from general human contact can be kept in a small wooden shed. Or just to keep a room / indoor space tidy. * You should check with your local planning office.